Hello there, today I have the Christmas card that I made for my mum this year to share with you. 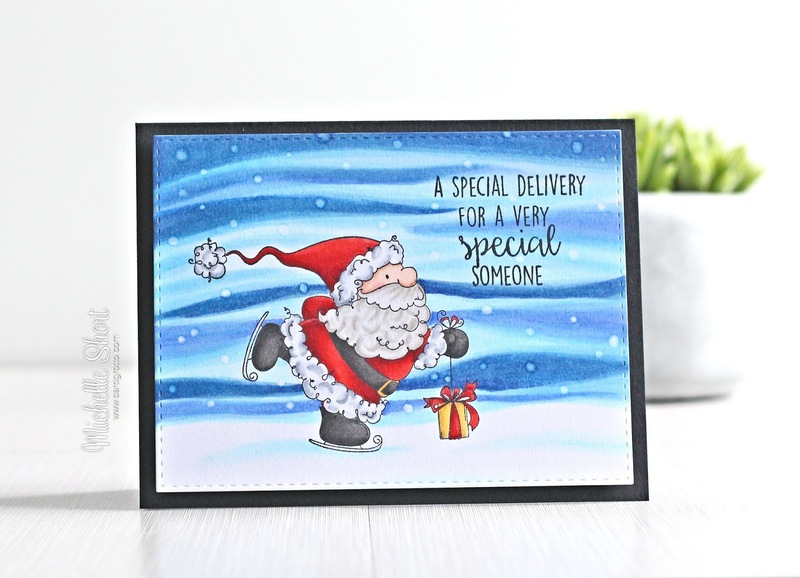 I love this image by Stamping Bella, he looks so happy skating around delivering presents. I have loved the backgrounds that Sandy Allnock has been doing recently, so I took inspiration from those and did my own version. I started off by taking a piece of white cardstock and cutting this using the largest of the SSS Stitched Rectangle dies. 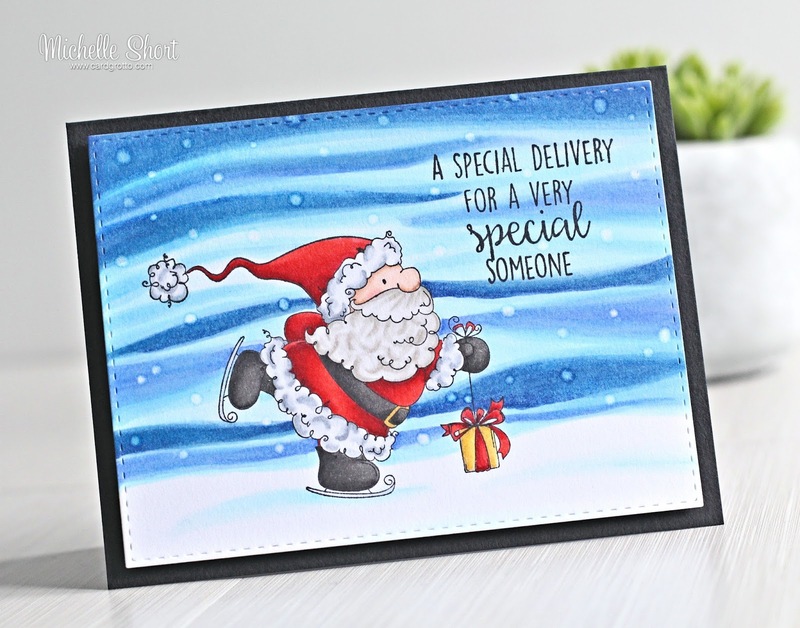 I then stamped Santa and the sentiment on to it using Memento Tuxedo Black ink. 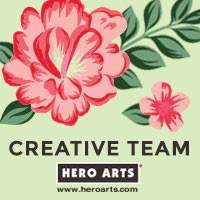 The whole image panel was coloured using Copic Markers (colours used listed below the supplies section). Once I had coloured the sky, I went in with the Colourless Blender and added spots to look like snow. This works better on some cardstocks than others but it gives a lovely subtle effect on this cardstock, I think. The panel was adhered to a top folding A2 black card base with foam tape. COPIC MARKERS - Santa: Skin - E13, E11, E00, R20. Beard - W3, W2, W1, W0. Clothing - R89, R37, R29, R29, R24, C5, C3, C1, C00. Belt - T9, T8, T7, T6, T5, Y28, Y17. Boots - T9, T7, T6, T5. Present: R89, R29, R24, Y28, Y17, Y21. Ground/snow: BG01, BG000, BG0000. Sky: B66, B63, B60, B45, B39, B34, B32, B21, B12, B00, B000, B0000, 0. The colouring took about an hour, but I know my mum loves my colouring so it was well worth the added time and effort. Thank you so much for visiting me today, I hope you have a lovely rest of the weekend. What a beautiful card! I am in awe of your coloring ability. Sandy Allnock is a great inspiration and a wonderful teacher. Thanks for sharing. 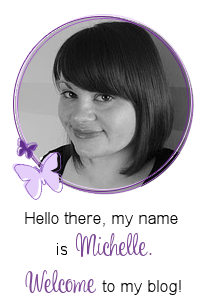 Wow, Michelle, gorgeous card! I love that windy background. i feel cold just looking at the background! What an adorable card. You can almost feel the wind blowing in your face. Thank you so much for sharing. Your Mother will love it. Definitely worth the time you spent colouring it, it's superb & I'm sure your Mum loves it! Just too cute...what an amazing and beautiful background sky! Just love your card. I love your colouring in this card Michelle, especially the sky! Perfect! !